1./NJGr.10 in Werneuchen with Fw 190/Bf 109, and was formed from parts of I./JG300. 2./NJGr.10 in Werneuchen and Finow with Bf 110/Ju 88. 3. /NJGr.10 in Finsterwalde with He 219 and later some Ta 154. Bonn-Hangelar was used by 1./NJGr.10 as a forward airfield. On 28 Aug 1944 half of 1./NJGr.10 was redesignated 2./NJG11, and 1./NJGr.10 was now based at Bonn-Hangelar and Darmstadt-Biblis. On 27 Oct 1944 the remainder of 1./NJGr.10 was redesignated 3./NJG11, and a new 1./NJGr.10 was formed at Bonn-Hangelar. Nov 1944 based at Werneuchen, with 1. staffel at Bonn-Hangelar and 3. staffel at Juterbog. In Feb 1945 1./NJGr.10 was renamed 7./NJG11. The Gruppe remained at Werneuchen until 6 Mar 1945, when transferred to Liebenwalde. 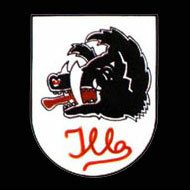 The unit was disbanded Apr 1945 and was absorbed by NJG5. All parts of NJGr.10 served under 1. Jagddivision until the end.